Net pay is the amount of an employee's pay (either salaried or hourly) after withholding for federal and state income taxes, and any additional paycheck deductions. Net pay is thus the amount actually received by the employee in his or her paycheck. 1. Start with gross pay. 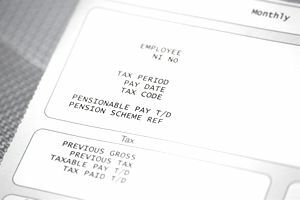 To begin the calculation of net pay, you must start with the employee's gross pay. Gross pay is the amount that is owed to the employee for the pay period (weekly, bi-weekly, semi-monthly, or monthly). Gross pay for hourly employees is the hours worked times hourly rate, with overtime premiums, if applicable. Gross pay for salaried employees is their annual salary divided by the number of pay periods in the year. TIP: All withholdings and deductions are based on gross pay. Withholding of different taxes and payments isn't incremental. 2. Deduct federal income tax withholding. The employee's tax bracket and filing status are used to determine the federal income tax withholding for the pay period. The additional withholding is added to these to get the total amount to be withheld from the employee's paycheck. The withholding amount for a specific pay period starts with gross pay and the type of pay period. Then the employee's marital status and the number of exemptions is included in the calculation, along with any additional amounts the employee wishes to have withheld. TIP: Be sure that you have the most recent W-4 form for each employee. Employees may submit a new W-4 form at any time, and as many times as they wish, but only once per pay period. TIP: It's illegal for an employer to help an employee complete a W-4 form. If the employee is unsure, direct him or her to this IRS withholding calculator. 3. Deduct any state and local withholding. State withholding is a little trickier because each state has different rules and forms for payroll withholding; some states have no withholding because they do not tax income. Different towns and cities also have their own rules. The Bureau of Labor Statistics has a chart of forms used by each state for calculating state income tax withholding. TIP: If an employee works in several states or different localities within a state, you may have to deduct state income tax from multiple states for anyone payroll. If you have employees in multiple states, you may want to get the help of a payroll service to try to keep all of these deductions straight. Some states have reciprocity agreements, meaning that they do not tax out-of-state income. For example, an employee who works in Iowa and who is a resident of Illinois does not have to pay Iowa income tax on his or her wages. Check this list of reciprocity agreements. FICA tax is a combination of OASDI (Social Security) and Medicare tax. The formula for calculating FICA tax is gross pay times the employee portion of the tax, which is 7.65 percent (6.2 percent for Social Security and 1.45 percent for Medicare). For example, if the employee's gross pay for that pay period is $500, the FICA tax to be withheld is $38.25. Check to be sure that the employee's total gross pay for the year does not exceed the Social Security maximum for that year. At the point where the employee's pay exceeds this maximum, you must stop withholding Social Security (the 6.2 percent). There is no maximum on the Medicare portion. You must also note when an employee's wages reach the amount for the Additional Medicare tax. This amount of gross pay depends on the employee's marital status. At this point, you must begin withholding an additional 0.9 percent (in addition to the 1.45 percent). Note that these changes in employee FICA tax withholding don't affect your requirements to pay FICA taxes as an employer. 5. Take any additional voluntary deductions. A number of voluntary deductions are possible, including health plan premiums, garnishments, and charitable donations. TIP: Be sure you have documentation in the employee's payroll file to show authorization for any deductions. The only exceptions are FICA taxes and garnishments or other court-ordered payments. Now that you have calculated gross pay, taken withholding for income taxes and FICA taxes, and any other deductions, you have a net pay amount. It's time to write the employee's paycheck. TIP: Federal law requires that with each paycheck you must provide each employee with information on year-to-date amounts for all calculations.